I’ve been busy working on a post about my week in food. By request, a few of you expressed interest in seeing the “normal, everyday” recipes we do around here, so every night since my Sweet Potato Pie post (below), I’ve been taking pics of some element of what we’ve eaten at most meals. There’s a few keeper recipes in there, so stay tuned! In a food processor or blender, combine the beets, cream, garlic, salt, and thyme. Process until smooth. Bring salted water to a boil in a large pot. Add the pasta and cook until it’s al dente. Drain, return the pasta to the pot, and fold in the sauce. Return to medium heat and cook until heated through, about 1 minute. Divide among warm bowls, sprinkle with pepper, and top with the parsley and almonds. Serve immediately. 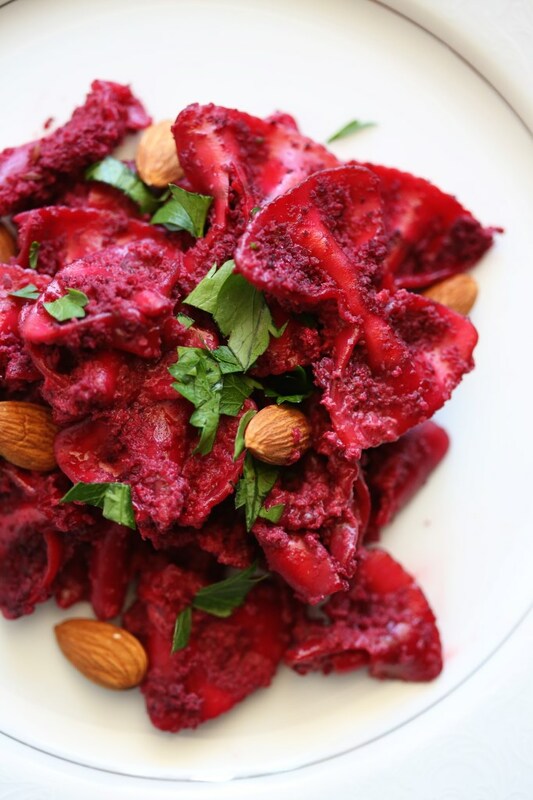 This entry was posted in Healthy Meals, Vegetables and tagged beet pasta, beets, halloween recipes, pasta. Bookmark the permalink.